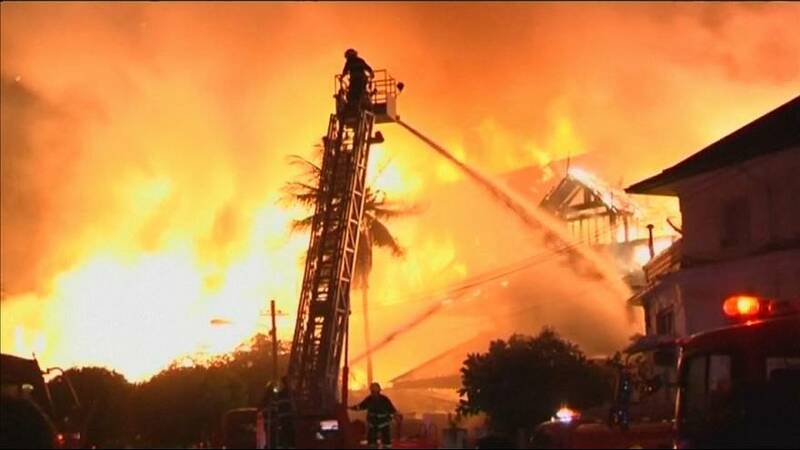 A huge fire has ripped through a luxury hotel in Myanmar’s biggest city of Yangon. The blaze broke out at the Kandawgyi Palace Hotel, a lakeside hotel popular with foreigners and a landmark in the city, at around 3 am local time on Thursday. Authorities said there were no fatalities and only one Chinese national was injured. But the Associated Press reported that one man died and two were injured. The fire, which started at around 3am, ravaged the teak upper floors of the hotel. Guests were moved to nearby hotels and it took firefighters several hours to put out the flames. On social media, photos and video showed the fire sweeping through the building and smoke rising from the five-star hotel hours after daybreak. Such terrible news that fire destroy Yangon’s Kandawgyi Hotel, Myanmar, a magical place.